Making maps for marketing and communications purposes just got simpler. ArcGIS Maps for Adobe Creative Cloud, a new app from Esri, brings the ArcGIS platform together with Adobe Photoshop and Illustrator to more seamlessly integrate geography and design. Now, design and communications professionals can have access to data-driven maps and geographic content from the Adobe programs they are already familiar with. This makes it easier for organizations to design maps that align with their branding conventions and that can be used for external projects and presentations. The ArcGIS and Adobe integration opens GIS up to an expanding group of design- and communications-focused users, who can now make direct use of spatial information. Cartographers can have the best of both worlds, too, since they can now work in Adobe and ArcGIS simultaneously. The ability to create distinct maps that fit any company’s style has never been more manageable, precise, or scalable. With ArcGIS Maps for Adobe Creative Cloud, users have access to thousands of data-driven maps, right inside Adobe’s design applications. This built-in connection to ArcGIS Online allows Adobe users to download spatial data—such as street maps, political boundaries, event layers, and satellite images—directly into Photoshop or Illustrator as editable vector layers or high-resolution images. 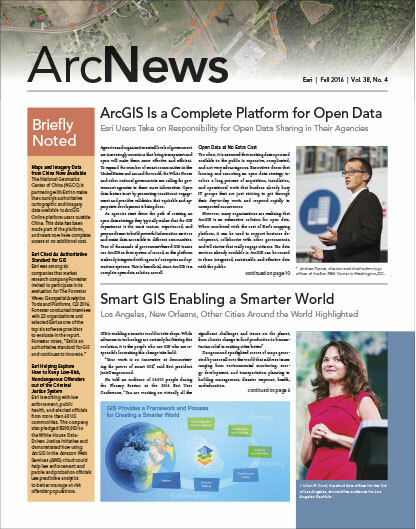 The integration between ArcGIS and Adobe is seamless. For the first time, users have tools that allow them to keep their content within ArcGIS and share it to Adobe’s design apps. Maps for Adobe Creative Cloud allows users to define map extents geographically or in Photoshop and Illustrator. Cartographers in particular can run spatial analysis in ArcGIS and access the results inside Adobe apps to create captivating maps. 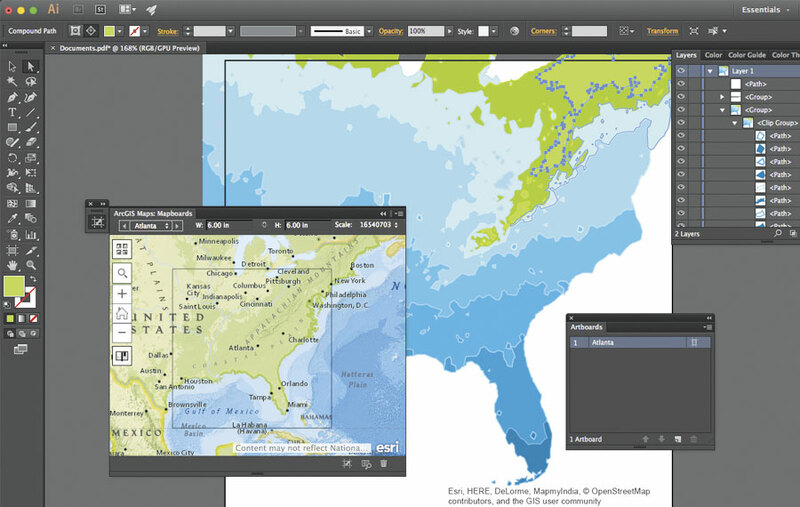 The geographic content available from within Maps for Adobe Creative Cloud includes maps and data layers compiled from Esri user organizations, open data sources, commercial vendors, and the Living Atlas of the World. Users also have direct access to their own organization’s maps, satellite images, and other geographic data. Users can search for this content from within Maps for Adobe Creative Cloud and filter by publisher or category. They can also search solely for their own GIS department’s collection of maps and data. When a deadline is looming, designers can quickly find the maps they want, preview them, and download them to use as is or to immediately start building on—all from within Photoshop and Illustrator. In Adobe Photoshop and Illustrator, users can download maps as editable vector layers or high-resolution images. Maps for Adobe Creative Cloud lets GIS users share their map assets with the design department in formats that designers know. To help them easily keep track of everything, the app allows designers to maintain editable vector artwork layers with descriptive names in Illustrator. This means that if a layer in an ArcGIS map is labeled State and National Parks, that layer will appear in Illustrator with the same title. Fostering cross-departmental collaboration like this cuts down on the valuable time teams typically spend going back and forth to improve the quality of derivative GIS products. It also makes it easier to use GIS not only for internal decision-making but for external communications, too, since designers know how to make data and analysis visually pop, as well as have maps conform to a company’s branding. Maps for Adobe Creative Cloud lets organizations extract maximum value from their ArcGIS and Adobe investments, boosting returns on investment for both suites of software. It also enhances collaboration and mutual productivity throughout an organization, saving both time and money. With Maps for Adobe Creative Cloud, GIS professionals can extend the significance of their work by making geographic analysis and maps available to larger audiences. That improves decision-making both inside an organization, with senior managers and executives, and externally, with clients and soon-to-be customers. Find more information and download the Maps for Adobe Creative Cloud beta. YouTube tutorials are available too. Send Esri your feedback as well by heading to the forums on the Early Adopter Community website.